(Newser) – Lady Gaga is mourning her friend and muse Rick Genest—better known as "Zombie Boy." The 32-year-old Canadian model, who went from the Quebec punk scene to catwalks around the world after his head-to-toe tattoos of bones, insects, and exposed brains made him famous, was found dead at his Montreal home Wednesday and police sources tell the CBC he died by suicide. 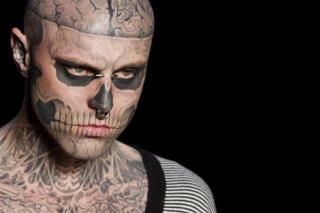 Genest, who got his first tattoo at 16, died six days before his 33rd birthday. He appeared in Gaga's 2011 "Born This Way" video, was once the face of Jay-Z's fashion label, and modeled for French designer Thierry Mugler, among others, the BBC reports. Wait a minute... if he was born this way, why does she think he had mental illness? I keep hearing that calling out mental illness issues is now verboten. Boys thinking they're girls and visa versa is a mental illness, but that has to be celebrated, not treated. These idiots can't keep anything straight and only cry foul after the suicide... which many who "transition" eventually do. GOOD RIDDANCE! we don't need crap like that in our society!!! Not possible. Wasn't he already?